Slow Cooker Beef Stroganoff, It's Easy & SO MOUTHWATERING! Every now and then, a recipe comes along that leaves us wondering how we ever survived without it. Slow Cooker Beef Stroganoff just happens to be one of those saints. 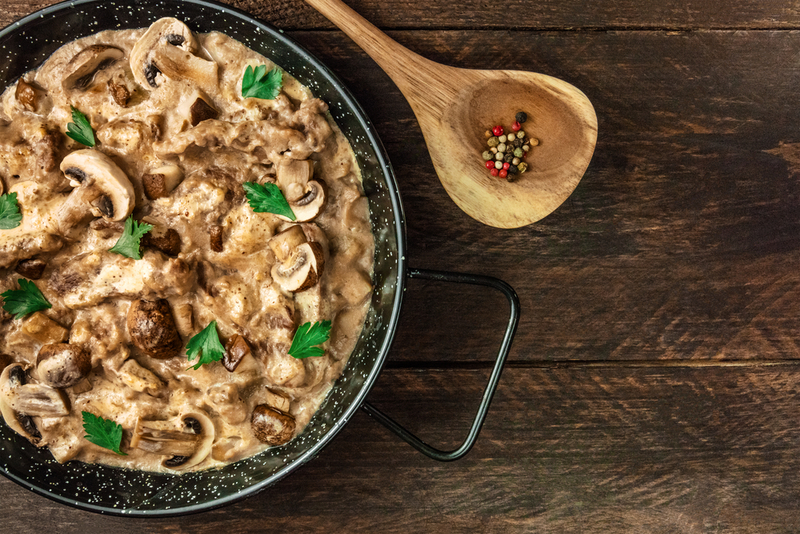 Nothing soothes the soul quite like a rich and creamy beef stroganoff. That’s why I was ECSTATIC to find this easy and delicious recipe for Slow Cooker Beef Stroganoff! The mushrooms are so juicy and flavorful from all the slow cooking — and the creamy sauce gets more savory with each bite. However, my FAVORITE part about this divine dish is still the flavor-soaked beef. Slow Cooker Beef Stroganoff is an affordable, convenient meal that will satisfy the toughest critics. Even kids will ask for seconds! The slow cooking process will tenderize even the toughest cuts, so using cheap cuts of beef is perfectly fine. Slow Cooker Beef Stroganoff isn’t any ordinary recipe, it’s truly extraordinary. Instead of stressing over dinner plans, just follow this recipe and come home to the hypnotic smell of a fuss-free meal. You will genuinely look forward to this meal every time! Slow Cooker Beef Stroganoff is the PERFECT comfort food with its robust flavors of beef and mustard combined with the exquisite flavors of cream and herbs. Layer the ingredients in the slow cooker in the following order: Onions/garlic, mushrooms, and beef. In a small bowl, combine the broth, mustard, Worcestershire sauce, salt, pepper, and thyme. Pour over the beef in the slow cooker. Cook on LOW for 7-8 hours or on HIGH for 4-5 hours. About 20 minutes before it’s done, add the beef broth/cornstarch mixture to the slow cooker and stir to combine. Cook until thickened. Stir in the cream cheese until dissolved. Stir in the sour cream and chopped fresh parsley and heat through. Add salt, pepper, and mustard to taste.